A founding partner of Vanguard Orchestral’s predecessor, Music Services, Brad has over 15 years experience as a repair technician and has worked in New Zealand, Canada and Tonga. He is well-known and sought-after throughout New Zealand for the high level of commitment, skill and creativity he brings to his work; traits that have seen him trusted by most of the top brass and woodwind players around New Zealand. 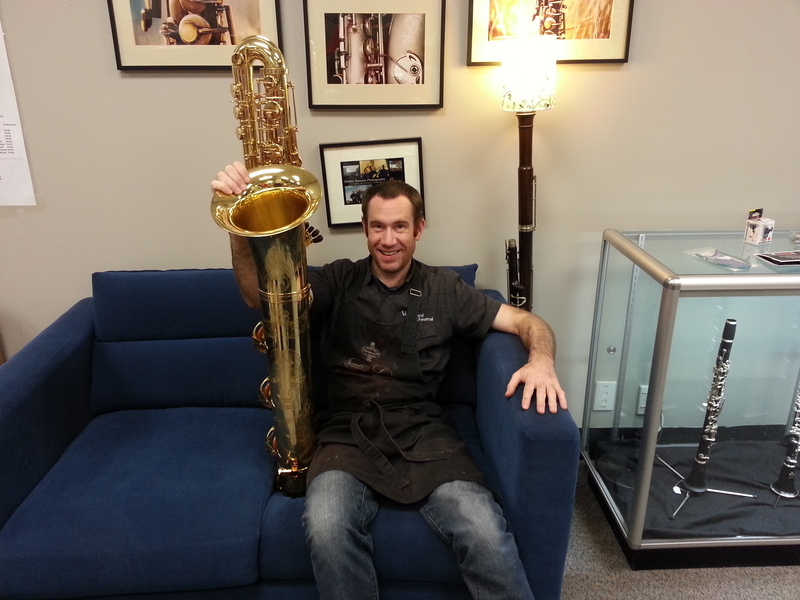 Brad’s career as a repair technician began after he completed a Bachelor of Music in Jazz Saxophone at Massey University of Wellington in 2001. While saxophone is his specialty, Brad is a competent multi-instrumentalist with a diverse playing history that spreads from lead alto saxophone in jazz combos and big bands through to percussion in brass bands and percussion ensembles. While at school, Brad studied under Auckland saxophonist Brian Smith and then, during his Bachelors Degree, under Colin Hemmingsen. The diversity of Brad’s playing career is reflected in his wide technical talent. Over the past few years, he has made a conscious effort to hone his craft in brass repairs, and has built a solid reputation for faultless dent work and an immaculate attention to detail. This has seen him trusted by many of this country’s top brass players. Brad enjoys any opportunity to explore custom brass work such as installing custom-built replacement french horn lead pipes, trumpet bells/lead pipes and trombone slides. On woodwinds, he loves custom work such as rebuilding the neck tenon section on saxophones, and clarinet tone hole replacement and crack repair. Throughout his career, Brad has sought to extend his knowledge and keep up to date with emerging techniques through membership of NAPBIRT and attendance at their conferences. He has also forged networks with esteemed colleagues around the world who are also at the forefront of their field. Brad has been the backbone of the successful business management systems within both Vanguard Orchestral and it predecessor Music Services, and has sought to extend his knowledge by studying business papers at Massey University. He is a regular invited speaker at Universities and music schools, where he delivers dynamic talks on the care and maintenance of brass and woodwind instruments, and on fostering the continued playing and uptake of those instruments within the education system.